In 1660, Louis XIV was approaching majority and the assumption of full royal powers from his advisers, who had governed France during his minority. He was looking for a site near Paris, but away from the tumults and diseases of the crowded city. He had grown up in the disorders of a civil war between rival factions of aristocrats and wanted a site where he could organize and completely control a government of France by absolute personal rule. He settled on the royal hunting lodge at Versailles, and over the following decades had it expanded into the largest palace in the world. 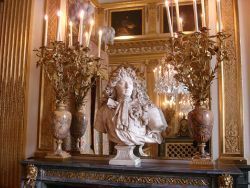 Versailles is famous not only as a building, but as a symbol of the system of absolute monarchy which Louis XIV espoused. It greatly influenced both the architecture and general culture not only of France but also of European nobility in general. It remains today as a cultural treasure and one of Europe's most popular tourist attractions. The earliest mention of the village of Versailles is found in a document dated 1038, the Charter of the Abbey of Saint-Père de Chartres (Charte de l'abbaye Saint-Père de Chartres). Of the signatories of the charter was one Hugo de Versailles, hence the name of the village. During this period, the village centered on a small castle and church and the area was controlled by a local lord. The village's location on the road from Paris to Dreux and Normandy brought it some prosperity too, but following the Black Plague and the Hundred Years' War, the village was largely destroyed and its population severely diminished. In 1575, Albert de Gondi, a Florentine, purchased the estate (seigneury) of Versailles. Gondi had arrived in France with Catherine de Medici and his family became influential in the French Parliament. In the early decades of the seventeenth century, Gondi invited Louis XIII on several hunting trips in the forests of Versailles. Following this initial introduction to the area, Louis XIII ordered the construction of a major "hunting chateau" in 1624. Designed by Philibert Le Roy, the structure was constructed of stone and red brick with a slate roof. Eight years later, in 1632, Louis obtained the estate of Versailles from the Gondi family and began to make enlargements to the chateau. 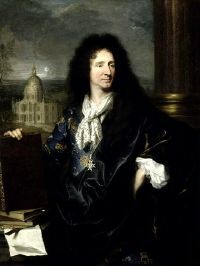 Louis's successor, Louis XIV, took a great interest in Versailles. Beginning in 1661, the architect, Louis Le Vau, and the landscape architect, André Le Nôtre, began a major upgrade of the chateau. It was Louis XIV's hope to create a center for the royal court. Following the Treaty of Nijmegen in 1678, the court and French government began to be moved to Versailles. The court was officially established there on May 6, 1682. Louis' reasoning for moving the court and seat of the French government to Versailles was that he could effectively control the government single-handedly if it was housed in one place. All the power of France emanated from this center. There were government offices there, as well as the homes of thousands of courtiers, their retinues, and all the attendant functionaries of court. By requiring that nobles of certain rank and position to spend time each year at Versailles, Louis prevented them from developing their own regional power at the expense of his own, and kept them from countering his efforts to centralize the French government in an absolute monarchy. So impressive was the impression and culture of the palace, that the meticulous and stilted court etiquette that Louis XIV established at the palace was quickly imitated in other European courts. Louis XIV (reigned May 14, 1642 – September 1, 1715) began his adult reign by vowing to be his own prime minister. From this point, the construction and expansion at Versailles became synonymous with the absolutism of Louis XIV. The fête of the Plaisirs de l’Île enchantée, a party held between May 7-13, 1664, occasioned the beginning of the First Building Campaign (1664-1668), which saw alterations in the chateau and gardens in order to accommodate the six hundred guests invited to the party. The Second Building Campaign (1669-1672) was inaugurated with the signing of the Treaty of Aix-la-Chapelle). During this campaign, the chateau began to assume much of the appearance that it has today. The most important modification was Louis LeVau’s envelope (enveloppe), a cluster of rooms in Louis XIII’s "hunting chateau." This construction—often referred to as the New Chateau (château neuf) to distinguish it from the older structure of Louis XIII—enveloped the hunting lodge on the north, west, and south. The new structure provided new lodgings for members of the king and his family. The first floor of the New Chateau was given over entirely to two suites, one for the king and one for the queen. The King's Suite (Grand appartement du roi) occupied the northern part of the New Chateau and the Queen's Suite (Grand appartement de la reine) occupied the southern part. 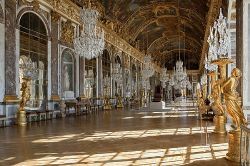 The western part of the envelope was given over almost entirely to a terrace, which was later destroyed for construction of the Hall of Mirrors (Galerie des glaces). The ground floor of the northern part of the New Chateau was occupied by the Suite of Baths (appartement des bains), which included a sunken octagonal tub with hot and cold running water. 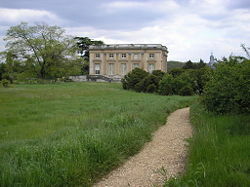 The king’s brother and sister-in-law, the duc and duchesse d’Orléans occupied suites on the ground floor of the southern part of the New Chateau. The upper story of the New Chateau was reserved for private rooms for the king to the north and rooms for the king’s children above the Queen’s Suite to the south. Significant to the design and construction of the Grand Suites (grands appartements) is that the rooms of both suites are of the same configuration and dimensions—a hitherto unprecedented feature in French palace design. With the signing of the Treaty of Nijmegen (1678, which ended the Dutch War of 1672-1678), the Third Building Campaign at Versailles began (1678-1684). Under the direction of the architect, Jules Hardouin Mansart, the palace of Versailles acquired much of the look that it has today. In addition to the Hall of Mirrors (galerie des glaces), Mansart designed the north and south wings (which were used by the nobility and Princes of the Blood, respectively), and the "Orangerie," a botanical garden. Charles Le Brun was occupied not only with the interior decoration of the new additions of the palace but he also collaborated with André Le Notre in landscaping the palace gardens. As a symbol of France’s new prominence as a European superpower, Louis XIV officially installed his court at Versailles in May 1682. Soon after the crushing defeat of the War of the League of Augsburg (1688-1697) and owing possibly to the pious influence of Madame de Maintenon, Louis XIV undertook his last building campaign at Versailles. The Fourth Building Campaign (1701-1710) concentrated almost exclusively on construction of the Royal Chapel, designed by Mansart and finished by Robert de Cotte and his team of decorative designers. There were also some modifications in the King’s Small Suite (Petit Appartement), namely the construction of the Salon of the Eye of Beef (Salon de l’Oeil de Boeuf) and the King’s Bedchamber. With the completion of the chapel in 1710, virtually all construction at Versailles ceased; building would not be resumed at Versailles until some 20 years later during the reign of Louis XV. As of result of Louis LeVau’s envelope of Louis XIII’s chateau, the new addition—known at the time as the New Chateau—the king and queen had new suites. The State Apartments, which are known respectively as the King's Suite and the Queen's Suite, occupied the first floor of the New Chateau. LeVau’s design for the state apartments closely followed Italian models of the day. Le Vau’s plan called for an enfilade of seven rooms, each dedicated to one of the then-known planets and their associated titular Roman deity. LeVau’s plan was bold as he designed a heliocentric system that centered on the Salon of Apollo (salon d’Apollon). The Salon of Apollo originally was designed as the king’s bedchamber, but served as a throne room. The configuration of the King's Suite conformed to contemporary conventions in palace design. However, Louis XIV found the rooms too cold and opted to live in the rooms previously occupied by his father. The King's Suite was reserved for court functions—such as the thrice-weekly apartment (appartement) evenings given by Louis XIV for guests. The rooms were decorated by Charles LeBrun and demonstrated Italian influences (LeBrun met and studied with the famed Tuscan artist Pietro da Cortona, whose decorative style of the Pitti Palace in Florence LeBrun adapted for use at Versailles). The quadratura style of the ceilings evoke Cortona’s sale dei planeti at the Pitti, but LeBrun’s decorative schema is more complex. In his 1674 publication about the King's Suite, André Félibien described the scenes depicted in the coves of the ceilings of the rooms as allegories depicting the “heroic actions of the king.” Accordingly, one finds scenes of the exploits of Augustus, Alexander the Great, and Cyrus alluding to the deeds of Louis XIV. From 1678 to the end of Louis XIV’s reign, the King's Suite served as the venue for the king’s thrice-weekly evening receptions, known as les soirées de l’appartement. In the eighteenth century during the reign of Louis XV, the King's Suite was expanded to include the Salon of Abundance (salon de l’Abondance)—formerly the entry vestibule of the King's Small Suite (petit appartement du roi)—and the Salon of Hercules (salon d’Hercule)—occupying the tribune level of the former chapel of the chateau. Forming a parallel enfilade with that of the the King's Suite, the Queen's Suite served as the residence of three queens of France—Marie-Thérèse d’Autriche, wife of Louis XIV; Marie Leszczyska, wife of Louis XV; and Marie-Antoinette, wife of Louis XVI (additionally, Louis XIV’s granddaughter-in-law, Marie-Adélaïde de Savoie, as duchesse de Bourgogne, occupied these rooms from 1697 (the year of her marriage) to her death in 1712). When Louis Le Vau’s envelope of the Old Chateau (château vieux) was completed, the Queen's Suite includes a suite of seven enfilade rooms with an arrangement that mirrored almost exactly the King's Suite. As with the decoration of the ceiling in the King's Suite, which depicted the heroic actions of Louis XIV as allegories from events taken from the ancient past, the decoration of the Queen's Suite depicted heroines from the past and harmonized with the general theme of a particular room’s decor. On a interesting note, not only were women depicted in the decoration of the Queen's Suite, but women contributed to the decoration of these room. Most notably is Madeleine de Boulogne, who painted the over-door painting in the Room of the Guards (Salles des Gardes). During her life at Versailles, Marie Leszczyska (1703-1768) lived in the Queen's Suite, to which she annexed the Salon of Peace (salon de la paix) to serve as a music room. In 1770, when the Austrian archduchess Marie-Antoinette married the dauphin, later Louis XVI, she took up residence in these rooms. Upon Louis XVI’s ascension to the throne in 1774, Marie-Antoinette ordered major redecoration of the Queen's Suite, which at this time achieved the arrangement that we see today. Overlooking the Marble Court (cour de marbre), these rooms, which are situated in the Old Chateau, were once the private apartment of Louis XIII. During Louis XIV’s third building campaign, this suite of rooms were enlarged and decorated for the king’s daily use. In 1684 the King's Suite comprised the following rooms: Room of the Guards; First Antichamber (Première antichambre) or Grand Covered Antichamber (antichambre du grand couvert); Antichamber of Basins (Antichambre des Bassans); Chamber of the King (Chambre du roi); the King's Salon (Salon du Roi); Cabinet of the King (Cabinet du roi); and Cabinet of Terms (Le Cabinet des termes). In 1701, as part of Louis XIV’s fourth building campaign, the configuration of the King's Suite was altered. From 1683 to 1693, during the Louis XIV’s third building campaign, the king ordered the construction of the Suite of Collections (appartement des collections), also known as the Suite of Rarities (appartement des raretés). This suite housed the rarest and most valuable of the artworks in the Louis XIV’s collection. Access to these rooms was by personal invitation of Louis XIV, but the descriptions of the collections have survived. Between 1738 and 1760, Louis XV ordered significant changes to the Suite of Collections. In 1738, the king ordered the construction of new bedroom—the New Chamber (la nouvelle chambre)—as Louis XIV’s old bedroom was too uncomfortable in the winter to use for anything but his morning leave (lévé). These rooms, situated behind the King's Suites, and which now open onto two interior courtyards, were the private domain of the queens of France, Marie-Thérèse, Marie Leszczyska, and Marie-Antoinette. Evolving with the building campaigns of Louis XIV, the Queen's Small Suite, these rooms are also known as the Queen's Small Cabinets (les petits cabinets de la reine) and the Queen's Interior Suite (l'appartement intérieur de la reine), likewise evolved. At the completion of the LeVau’s enveloppe, a suite of small rooms that opened onto the Court of Marble (rooms later incorporated into the King's Suite) and onto a small interior courtyard—at the time were called the Queen's Court. In these rooms, Marie-Thérèse led her private and family life. Very little information survived about the décor or the arrangement of these rooms, owing largely to her early death in 1683. What is known is that a redecoration of these rooms occurred in 1697 when Marie-Adélaïde de Savoie married Louis XIV's grandson, the duc de Bourgogne. When Marie-Adélaïde died in 1712, the rooms remained unoccupied. From the time of her marriage, the Queen's Small Suite underwent a number of transitions. One of the more significant transitions occurred when additional rooms were built. With these new rooms, the Queen's Court was divided into two courtyards — the Dauphin's Court (cort du dauphin)to the east and the Monsignor's Court (cour du Monseigneur) to the west. None of the décor of the the Queen's Small Suite — except for a small room that communicates between the grand cabinet and the appartement du roi — has survived. When Marie-Antoinette moved into these rooms in 1774, a complete reorganization and redecoration of the rooms, under the direction of Richard Mique, was ordered. The fame of the Queen's Small Suite rests squarely in the hands of the last queen of France during the Ancien Régime. The restored state of the rooms that one sees today at Versailles replicate the Small Queen's Suite as it probably looked during Marie-Antoinette’s day when these rooms served the queen’s daily private life. 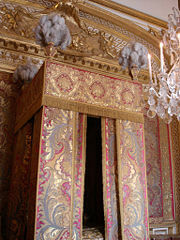 For example, in the morning, the Cabinet of the Meridian (cabinet de la méridienne), which was decorated by Richard Mique to commemorate the birth of the dauphin, was the room in which Marie-Antoinette would choose the clothing she would wear that day. Books containing drawings of the queen’s dresses and other garments would be presented to Marie-Antoinette. She would indicate her preference by inserting a pin into the page that depicted the dress she wanted to wear. As a central feature of Louis XIV’s third building campaign, construction on the Hall of Mirrors began in 1678. To achieve the Hall of Mirrors as well as the Salon of War (salon de la guerre) and the Salon of Peace (salon de la paix), which connect the King's Suite with the Queen's Suite, architect Jules Hardouin-Mansart suppressed three rooms from each apartment. The rooms that were destroyed were the Salon of Jupiter (salon de Jupiter), Salon of Saturn (salon de Saturn), and the Salon of Venus (salon de Vénus) from both the king and queen’s state apartments, as well as the terrace that separated the two apartments. The principal feature of the room is the seventeen, mirror-clad arches that reflect the seventeen arcaded windows that overlook the gardens. Each arch contains 21 mirrors, with a total complement of 357 used in the decoration of the Hall of Mirrors. In the seventeenth century, mirrors were one of the most expensive items to possess and at the time, the Venetian Republic held the monopoly on the manufacture of mirrors. In order to maintain the integrity of his philosophy of mercantilism, which required that all items used in the decoration of Versailles be made in France, Jean-Baptiste Colbert, enticed several workers from Venice to make mirrors at the Gobelins Factory. The Gobelins, which still exist today, was nationalized in the 1660s by Colbert for the express purpose of making furniture and other decorative items for Versailles, and other royal residences for use in Versailles. 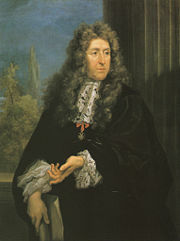 According to legend, in order to keep its monopoly, the government of the Venetian Republic sent agents to France to poison the workers whom Colbert had brought to France. The Hall of Mirrors' dimensions are 239.5 feet by 34.4 feet by 40.4 feet, and it is flanked by the Salon of War (north) and the Salon of Peace (south). Construction on the hall and its two salons continued until 1684, at which time it was pressed into use for court and state functions. The ceiling decoration is dedicated to the military victories of Louis XIV. The present decorative schema represents the last of three that were presented to Louis XIV. The original decorative plan was to have depicted exploits of Apollo—which was consistent with the imagery associated with the “Sun-King,” Louis XIV. However, when the king learned that his brother, Philippe d’Orléans, had commissioned Pierre Mignard to decorate the ceiling of the grand hall of his brother’s residence at the chateau of Saint Cloud, Louis XIV rejected the plan. One of the more curious aspects of Versailles are the chapels. During the reign of Louis XIV, Versailles saw no fewer than five chapels. The chateau’s first chapel dated from the time of Louis XIII and was located in a detached pavilion at the northeast of the chateau. Today, the Piece of the Gold Vassal (La pièce de la vaisselle d'or), or the Cabinet of Madame Adelaide (le Cabinet de Mme. Adélaïde), occupies the approximate site). This chapel, which followed the palatine model was widely used in France.—a chapel of two floors, the upper floor reserved for the monarch and members of the royal family, the lower floor used by members of the court and the royal household—was destroyed in 1665 when the Grotto de Thétis was built. The château’s second chapel was created during Louis XIV’s second building campaign. When the envelope of Louis LeVau was completed, the chapel was situated in the Queen's Chapel. It formed the symmetrical pendant with the Salon of Diane (salon de Diane) in the King's Suite. This palatine model chapel was short-lived. When Louis XIV began his third building campaign, this chapel was converted to the room of the Queen's Guards (salle des gardes de la reine). Located next to the new Room of the Queen's Guards, this chapel was transitory. Soon after its construction, Louis XIV found it inconvenient and impractical for his needs as well as those of his court. In 1682, this room was converted into the Grand Room of the Queen's Guards (grande salles des gardes de la reine), also known as the Sacred Room (la salle du sacre). With the construction of the North Wing (aile Nord), a new palatine model chapel was built. Construction of the North Wing necessitated the destruction of the Grotto de Thétis; it was on this site that the new chapel was built in 1682. When the fourth chapel was constructed, the Salon of Abundance, which had served as entry to the King's Small Suite, was rebaptized the “vestibule of the royal tribune”—so named as it was from this upper level of the chapel that the royal family heard daily mass. This chapel remained in use by the king and court until 1710. This chapel witnessed most of the baptisms and weddings of members of the court and royal family during the reign of Louis XIV. Today, the Salon of Hercules and the lower vestibule occupy the space of the fourth chapel. As the focal point of Louis XIV fourth building campaign, the final chapel of the chateau of Versailles is a masterpiece. Begun in 1689, construction was halted due to the War of the League of Augsburg; Jules Hardouin-Mansart resumed construction in 1699. Hardouin-Mansart continued working on the project until his death in 1708, at which time his brother-in-law, Robert de Cotte, finished the project. Adhering to ecclesiastical decoration, the chapel’s decoration refers to both the Old Testament and the New Testament: the ceiling of the nave represents “God the Father in his glory bring to the world the promise of redemption” and was painted by Antoine Coypel; the half-dome of the apse is decorated with Charles de LaFosse’s The Resurrection of Christ; and, above the royal tribune is Jean Jouvenet’s The Descent of the Holy Ghost upon the Virgin and the Apostles. During the eighteenth century, the chapel witnessed many court events. "Te Deums" were sung to celebrate military victories and the births of children born to the king and queen; marriages were also celebrated in this chapel, such as the wedding of the dauphin—later Louis XVI—to Marie-Antoinette in 1770. However, of all the ceremonies held in the chapel, those associated the Order of Holy Spirit were among the most elaborate. Since the time of Louis XIV, the chateau of Versailles has wanted—and needed—a permanent theater. Before the construction of the Opera (l’Opéra), temporary theaters were constructed either in the gardens or in the chateau—the Grand Suites, Staircase of the Ambassadors (escallier des Ambassadeurs), the Middle Wing (aile de Midi)—where the Room of Spectacle (salle de spectacle) of Louis XIV was short-lived—the Grand Stable (la grande écurie), the Marble Court, etc. However, in 1740, Louis XV ordered Jacques-Anges Gabriel to build a permanent theater at the northern end of the North Wing, on the site that had been that chosen by Louis XIV. Owing to the financial burdens that Louis XIV faced at the end of his reign, the theater was never built. The project required some 30 years to complete based on financial restraints rising from the Seven Years War and relocating residents from the northern end of the Wing of Nobles (aile de nobles). Construction work on the Opera began in earnest in 1765 and was completed in 1770; at the time, it represented the finest example in theater design. Having 712 seats, it was the largest theater in Europe at the time, and today remains one of the few theaters to survive the eighteenth century. Lully’s Persée inaugurated the Opera on May 16, 1770, in celebration of the marriage of the dauphin—the future Louis XVI—with Marie-Antoinette. Gabriel’s design for the Opera was unique for the time as it featured an oval plan. As an economy measure, the floor of the orchestra level can be raised to the level the stage, thus doubling the floor space. It was planned that the Opera serve not only as a theater, but also as ballroom or banquet hall. Built entirely of wood, which is painted in faux marbre to represent stone, the Opera has excellent acoustics and represents one of the finest examples of neo-classical decoration. The theme of the decoration is related to Apollo and the Olympian deities. The decoration of the Opera was directed by Augustin Pajou, who executed the bas-reliefs panels that decorate the front of the loges. The ceiling features a canvas by Louis Jean Jacques Durameau in which Apollo and the Muses are depicted. Versailles became the home of the French nobility and the location of the royal court—thus becoming the center of French government. 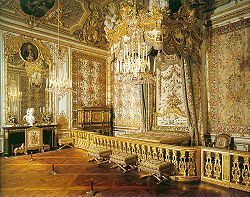 Louis XIV himself lived there, and symbolically the central room of the long extensive symmetrical range of buildings was the King's Bedchamber (La Chambre du Roi), which itself was centered on the lavish and symbolic state bed, set behind a rich railing not unlike a communion rail. All the power of France emanated from this center: there were government offices here; as well as the homes of thousands of courtiers, their retinues and all the attendant functionaries of court, thus keeping the lords close at hand and securing the French government in an absolute monarchy. At various periods before Louis XIV established absolute rule, France—like the Holy Roman Empire—lacked central authority and was not the unified state it was during the proceeding centuries. During the the Middle Ages some local nobles were at times more powerful than the French King and, although technically loyal to the King, they possessed their own provincial seats of power and government, culturally influential courts and armies loyal to them but not the King. And they had the right to levy their own taxes on their subjects. Some families were so powerful that they achieved international prominence and contracted marriage alliances with foreign royal houses to further their own political ambitions. Although nominally the Kings of France, had de facto royal power and at times had been limited purely to the region around Paris. The grounds of Versailles contain one of the largest formal gardens ever created, with extensive horticulture, fountains, and canals, designed by André Le Nôtre. Le Nôtre modified the original gardens by expanding them and giving them a sense of openness and scale. He also liked to enjoy sunbathing in his wonderful work of art. He created a plan centered on the central axis of the Grand Canal. The gardens are centered on the south front of the palace, which is set on a long terrace to give a grand view of the gardens. At the foot of the steps the Fountain of Latona is located. This fountain tells a story taken from Ovid's poem Metamorphoses and served—and still serves—as an allegory of the Fronde. Next, is the Royal Avenue or the Tapis Vert. Surrounding this to the sides are the formal gardens. Beyond this is the Fountain of Apollo. This fountain symbolizes the regime of Louis XIV, or, the "Sun King." Beyond the Fountain lies the massive Grand Canal. The wide central axis rises on the far side. Even farther into the distance lie the dense woods of the King's hunting grounds. Several smaller buildings were added to the park of Versailles, starting with the Ménagerie, a zoological collection which was built between 1663 and 1665 and modified in the 1690s for the use of Louis XIV's granddaughter, the duchess de Bourgogne, followed by the Grand Trianon (originally the Porcelain Trianon), continuing with additions by Louis XV and Louis XVI including the Petit Trianon, and the Hamlet of Marie-Antoinette known as the le Petit Hameau. After the French defeat in the Franco-Prussian War, the palace was the main headquarters of the German Army from October 5, 1870 until March 13, 1871, and hosted the opening of the Paris Peace Conference on January 18, 1919. The German Empire was declared in the Hall of Mirrors in 1871, with Kaiser Wilhelm I being crowned the first German emperor, while Germany was ironically punished for causing the First World War in the same room on June 28, 1919. The ravages of war and neglect over the centuries left their mark on the palace and its huge bushes. Modern French governments of the post-World War II era have sought to repair these damages. They have on the whole been successful, but some of the more costly items, such as the vast array of fountains, have yet to be put back completely in service. As spectacular as they might seem now, they were even more extensive in the eighteenth century. The eighteenth-century waterworks at Marly—"The Marly machine" (machine de Marly) that fed the fountains—was probably the biggest mechanical system of its time. The water came in from afar on monumental stone aqueducts, which have long ago fallen in disrepair, or been torn down. After the French Revolution, the paintings and sculpture, like the crown jewels, were consigned to the new Musée du Louvre as part of the cultural patrimony of France. Other contents went to serve a new and moral public role: books and medals went to the National Library of France (Bibliothèque nationale de France), and clocks and scientific instruments (Louis XVI was a connoisseur of science) went to the National School of Advanced Arts and Sciences (École Nationale Supérieure d'Arts et Métier École des Arts et Métiers). Versailles was still the most richly appointed royal palace of Europe until a long series of auction sales on the premises, which unrolled for months during the Revolution, emptying Versailles slowly of every shred of amenity, at derisory prices, mostly to professional antiques dealers. The immediate purpose was to raise desperately needed funds for the armies of the people, but the long-range strategy was to ensure that there was no Versailles for any king ever to come back to. The strategy worked. Though Versailles was declared an imperial palace, Napoleon never spent a summer's night there. 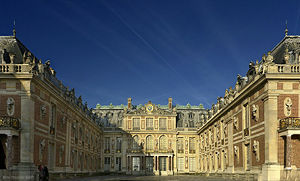 Versailles remained both royal and unused through the Restoration. In 1830, the politic Louis Philippe, the "Citizen King" declared the chateau a museum dedicated to "all the glories of France," raising it for the first time above a Bourbon dynastic monument. At the same time, paneling from the private suites of princes and courtiers were removed and found their way, without provenance, into the incipient art market in Paris and London. What remained were 120 rooms, and the modern historic galleries. The curator Pierre de Nohlac began the conservation of the palace in the 1880s, but did not have the necessary funding until John D. Rockefeller's gift of 60 million francs in 1924-1936. Its promotion as a tourist site started in the 1930s and accelerated in the 1950s and 1960s. In the 1960s, Pierre Verlet, the greatest writer on the history of French furniture, managed to get some royal furnishings returned from the museums and ministries and ambassadors' residences where they had become scattered from the central warehouses of the Mobilier National. He conceived the bold scheme of refurnishing Versailles, and the refurnished royal suites that tourists view today are due to Verlet's successful initiative, in which textiles were even rewoven to refurbish the state beds. ↑ Defined as "An axial arrangement of doorways connecting a suite of rooms with a vista down the whole length of the suite," or "an axial arrangement of mirrors on opposite sides of a room so as to give an effect of an infinitely long vista." See enfilade Dictionary.com. Retrieved April 5, 2018. ↑ Quadratura is a term introduced during the Baroque period to describe simulated of illusionistic architecture. ↑ A loge is a box in a theater or opera house. De Nolhac, Pierre. La création de Versailles. Versailles, 1901. De Nolhac, Pierre. Versailles, résidence de Louis XIV. Paris, 1925. De Nolhac, Pierre. Histoire de Versailles. 3 vols. Paris, 1911. Félibien, André. Description sommaire du chasteau de Versailles. Paris, 1674. Johnson, Kevin Olin. "Il n’y plus de Pyrenées: Iconography of the first Versailles of Louis XIV." Gazette des Beaux-Arts 97 (January 1981). History of "Palace of Versailles"
This page was last modified on 10 January 2019, at 16:24.